Beaufort West is regarded as the halfway mark when travelling on the N1 between Cape Town and Bloemfontein. The highway runs right through the town, which is lined with a myriad of places to stay. But what we noticed when last there was that the town appears to have undergone something of a transformation from downright shabby to shabby chic, and one’s eye is drawn less to the fast food joints, and more to the history of the town – the typical Karoo buildings dotted here and there like flourishing succulents in amongst stones. 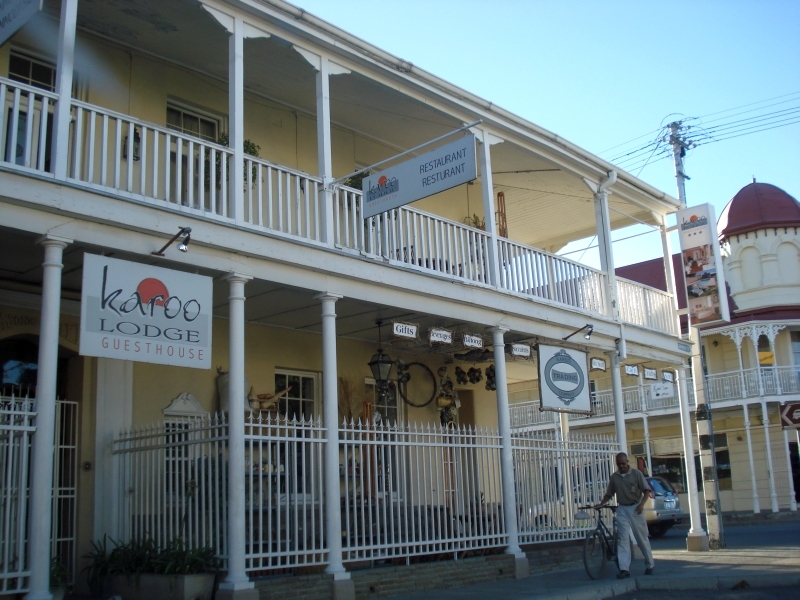 Beaufort West is not only the oldest town in the Central Karoo, it is also a thriving little town, if our quick visit was anything to go by. 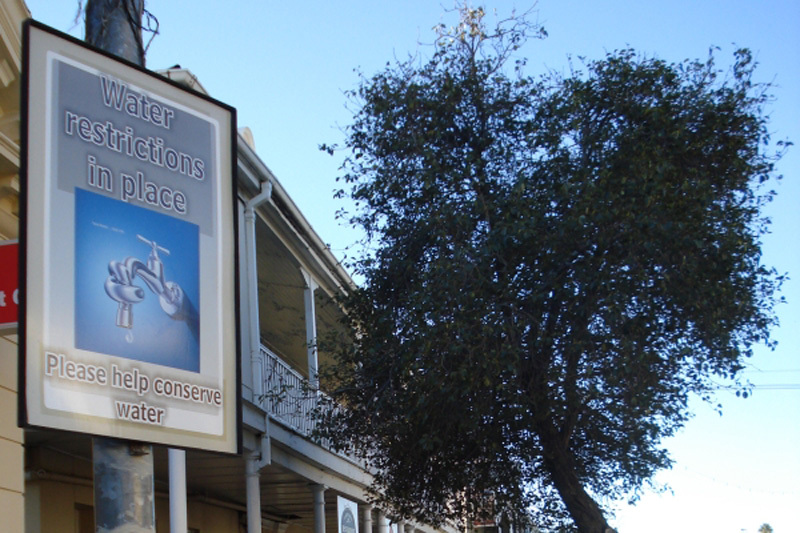 Not only is there now a new Checkers centre with a huge, well-stocked Checkers store, and a Pick n Pay in the town (good news for anyone visiting the Karoo National Park and needing to stock up), but the historical Karoo buildings have by and large been restored and looked after, and the town’s tourist information office is buzzing. There is also a butchery called something like Groot Marino that I believe stocks excellent boerewors and biltong, for those keen on a few nights’ worth of braaivleis under the stars. And Donkin Street is lined with little shops that sell things like wooden furniture, coffee shops, guest houses, internet cafés, the Old Town Hall and The Parsonage to name but a few buildings. Also look out for examples of ‘snecked’ masonry, or dressed stone architecture, like the building next to the library that was once a school. Beaufort West’s people are helpful and friendly. The two ladies at the tourism office jumped through hoops to help me find information, not only of their town, but of anything in the vicinity, and lots of routes and accommodation that wasn’t. This was true Karoo hospitality, given that they also managed to sell me the little jewel of a book called Karoo Keepsakes by Chris Marias and Julienne du Toit – not that I needed much persuading, as I’ve been a fan of their writing for a while! The two photo journalists live in and write about the Karoo, not exclusively, but certainly passionately, and their book is filled with anecdotes and gorgeous pictures. Beaufort West comes with a rather romantic history filled with clashes at water fountains, conflict with Xhosa tribesmen and more. In summary, you had to be rather a toughie to have come to the Karoo in the first place at all. Men were banished here after a rebellion known as Slagtersnek, as this part of the world was considered remote enough for them not to do any more harm. It was only in 1818 that a town was established here, named after the fifth Duke of Beaufort, so as to bring both religion and law and order to the region. What started as a little church with a thatch roof then became the Neo-Gothic edifice that today dominates the town, as churches do in many towns in South Africa (this propensity for a church as the centre of town is all due to the British who liked towns to have churches and official buildngs at their heart). And the Town Hall, where you’ll find a Chris Barnard exhibition (he was born and bred here) is one of the oldest in the entire Country – worth a stop for. Beaufort West lies at the foot of the Nuweveld Mountains, its streets lined with pear trees, some of which date back to the 1830s. What is mainly farming country is also now a town that makes its living largely from tourism. Donkin Street, the main street through town, is dominated by hotels and guest houses, but drive down Bird Street, parallel to this, and you’ll find an increasingly exciting part of town. 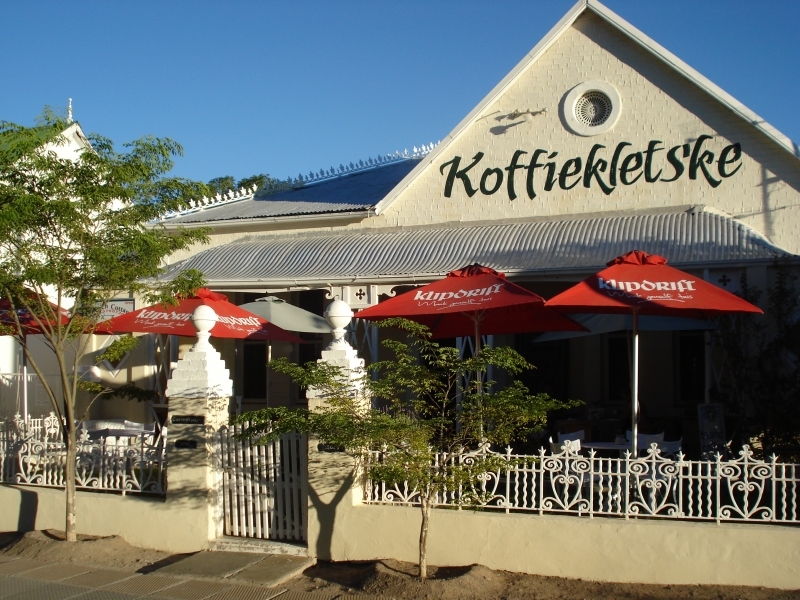 Here B&B lies alongside B&B, character homes predominate, and the odd coffee shop with names like Koffie Kletzke, in Meintjies Street, lead off here like tributaries of a river. It never fails to amaze me how assuming a main road is all there is to see, one can leave a town with completely the wrong impression. Although in Beaufort West’s case, the main road is central to something of a tale. The story goes that Sir Rufane Donkin, after whom the street is named and who was acting governor of the Cape for a year from 1820, lost his wife whilst stationed in India. Such was his love for her that he had her heart embalmed and took it everywhere with him, finally choosing to be buried with it in England on his death. Whether the story makes you all warm and fuzzy is debatable, but it’s an interesting titbit. Christiaan Barnard wasn’t the only famous person to emerge from the town. 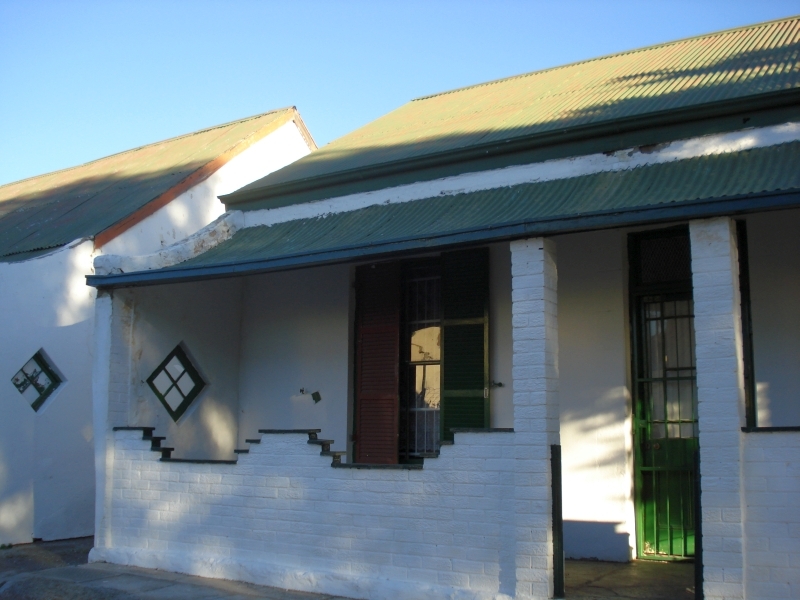 It was also home to Cromwell Everson, the composer who wrote the first ever Afrikaans opera – Klutaimnestra, an opera in four acts, in 1967. Some of you might remember his warm eyed, fuzzy beard from the Natal Technikon where he was head of performing arts between 1976 and 1991, and he gave David Kramer music lessons whilst living in Worcester. Beaufort West lies in what is regarded as the world’s richest collecting ground for ancient reptile fossils, and collections have made their way to museums not only in South Africa but also in Europe and the United States. Take the Fossil Trail at the nearby Karoo National Park and you can learn more about them. It doesn’t take longer than a couple of minutes to drive through the town, but invariably, along the way, you’ll pass a mbongolo, or donkey cart, one of the major forms of transport of the Karoo. There are now a series of locally built carts from 100% recycled materials that serve as a social upliftment project, and offer visitors an alternative way of seeing the town. Alternatively one can use these to travel through the local township, KwaMandlenkosi, named after a young Mandlenkosi “Tsaka” Kratchi, a promising young boxer shot by police during a raid in 1985. His death so shook the community that they changed their township name from Sidesaviwa. Whether you’re just passing through, slowing down only to avoid the odd donkey cart, or staying overnight, take my advice and don’t speed through this part of the Karoo. 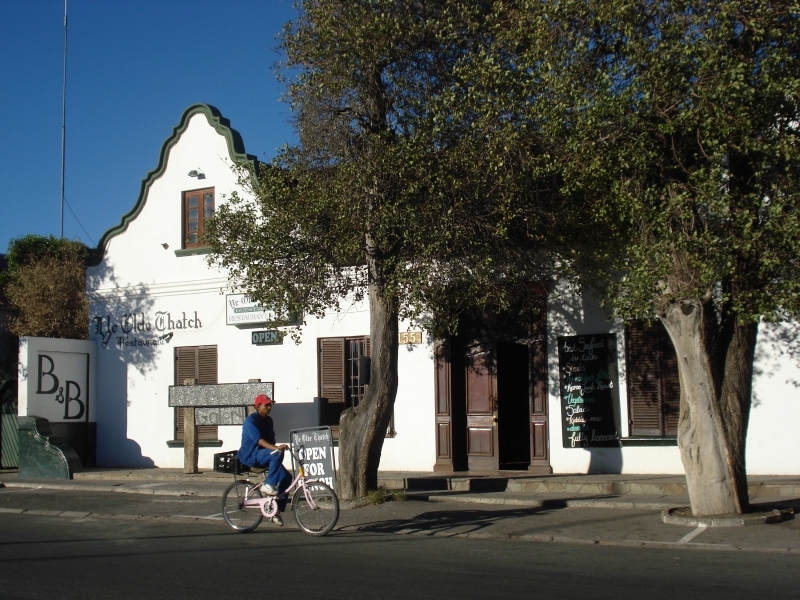 Instead, drink in the old-time architecture, the sense of quaint vitality that makes little towns like this so vivid, and enrich your experience of the Karoo.